Saving the planet, one bulb at a time. Illume Energy Efficient Bulbs by Ecobility are designed to produce comfortable white lighting while consuming less than a quarter of the energy regular bulbs require. Over its lifetime, each Illume bulb prevents the release of 280kg of carbon emissions. For Illume, it was not only important to bring attention to its specifications, creating packaging that extended its environment-friendly nature was as important. Illume bulbs were only sold in twin packs. Much research went into sourcing materials for Illume’s packaging. From using recycled paper and recyclable plastic to create the pack, to printing using soy based ink, much care was taken to ensure that every aspect of the pack's creation had a reduced impact on the environment. Made from 100% recycled paper, this pack uses 80% less water and 65% less energy to make. It also reduces the amount of CO2 released in the atmosphere by 95%. It uses recycled plastic which saves 1.8 tonnes of oil for every tonne produced. And with printing done in soy ink, it also prevents an significant amount of Volatile Organic Compounds (VOCs) from being released into the atmosphere. Illume bulbs were initially sold exclusively through Emarat petrol pumps. Demand were so great, willing retailers started sponsoring. Retailers such as Ace Hardware and Carrefour quickly followed. Even the packing and shipment methods were rigourously tested, resulting in a specially sized two-bulb pack that could be transported safely and efficiently in optimized compact stacks, reducing our carbon footprint by necessitating fewer shipments. In these ways, we showed Ecobility’s sincere commitment to saving the environment. An integrated campaign revolved on the 'Good Idea VS Bad Idea' where every person is made to ponder and hopefully will make the switch. Press Ads were launched across all national papers in English and Arabic. Various partners contributed to our pro bono cause. Partners like the UAE Federal Government and Nakheel of the Dubai World pitched in and subsidized a portion of the retail cost for each Illume bulb just to make the cost within everyone's reach. Outdoor media spaces were donated including recycling bins across the country were also branded. Developed by Flip Media, the website was launched to educate the public on how easy it is to make the switch. More and more local companies came forward to support the Make the Switch campaign. Some even donated space on their water bottles to help spread our message. 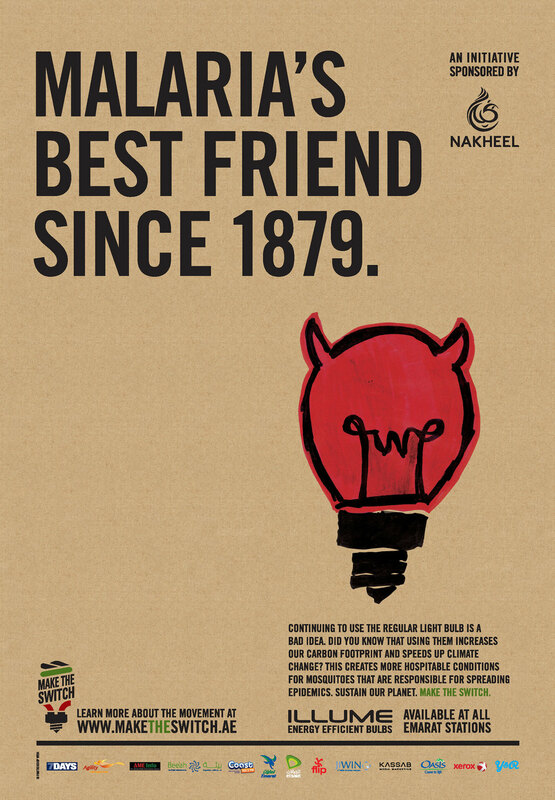 Launched on November 16, 2008 through a sustained integrated campaign, Illume lightbulbs have since helped save over 436,087,620 KWH of energy and 95,150,607 Dirhams in energy costs. By early 2010, almost a million lightbulbs have been sold and almost 30 offices, residential developments and hotels, including the Hyatt Regency, Shangri-la Hotels and the Jumeirah Hotels & Resorts, have made the switch to Illume lightbulbs.